If you have a sluggish PC, or one that experiences unexplained problems or crashes, you may have a Registry problem. Outdated or incorrect Registry entries can cause a variety of serious problems--and on your own, you'll never be able to find them. 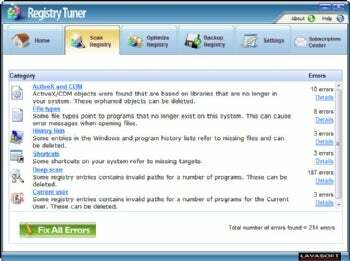 Lavasoft Registry Tuner (buy-only, $30 for a one-year license) does an excellent job of finding Registry problems and fixing them, to help keep your system in top shape. Lavasoft Registry Cleaner does an excellent job of finding Registry errors and fixing them. Lavasoft Registry Cleaner is exceedingly simple to use: Tell it to scan your system, and it goes about finding problem in a few minutes, taking about the same amount of time as similar programs. It then displays a summary of the Registry issues it finds, grouped by category. You can dig down into each category, to see individual errors. If you'd like, you can tell it to clean only some errors, or instead tell it to fix them all, either by individual entry or entire categories, such as ActiveX and COM sections, or Application paths. If you don't want to review the results, you can choose the one-click option, which scans and corrects, so you won't have to pay attention to its work. You can also schedule Lavasoft Registry Cleaner to automatically clean your Registry. As with other cleaners, it will back up your Registry automatically so that you can restore your PC to its previous state in the case of any problems. The program will also optimize your Registry by compacting it, which it claims leads to improved PC performance, although I could not confirm that. (You can tell the program to compact your Registry at any time. When you select a one-click tuneup, it compacts your Registry as well). Be aware that when it compacts your Registry, it restarts your PC without first asking you. How does it stack up against other Registry cleaners? On my system, it found 214 errors, while the similarly priced RegistryBooster 2010 found 17, and the free CCleaner found none. On the other hand, unlike Registry Booster 2010, it does not rate the damage level for each Registry error from low to high. Lavasoft Registry Cleaner appears to be the most comprehensive cleaner of the bunch, though. It's the one to go with for finding and fixing the most Registry errors.